The Album Of The Day is the new self-titled release by Blood Ceremony. "Sure, there are a mess of bands out there that are brilliantly effective at channeling the '70's, but not that many have had as strong an impact as Sweden's Witchcraft. Their debut did more than just ape vintage Pentagram – it sounded like it was actually recorded at the start of that decade and was a long lost gem from another era. For better or worse, numerous like-minded bands have spawned in their wake. The latest is Canada's Blood Ceremony, who goes so far as to label its music as “witch rock.” Sure, the band probably means they're occult influenced, but given the vintage feel of Blood Ceremony and Witchcraft's catalog, it's hard not to draw comparisons. And yet while Blood Ceremony does share some of the same Pentagram- and Roky Erikson -isms, they're strong enough to be taken on their own (provided you aren't familiar with Jex Thoth, that is). 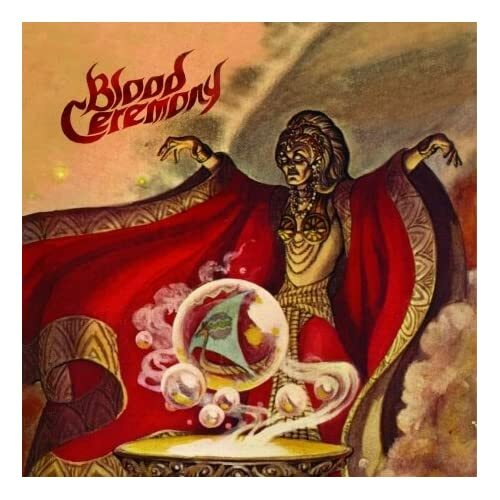 Blood Ceremony, as it's been said on this website, sounds like Jethro Tull had Tony Iommi joined the band back in 1968 - bluesy doom accented by flute and with a generous amount of folksy psychedelics. What also sets Blood Ceremony apart from their retro-minded contemporaries are the vocals, courtesy of Alia O'Brien (who's also the flutist). She brings a faint Jefferson Airplane vibe, which heightens the Wyrd Folk aspect of the album. The songs are fairly consistent throughout, but it's the last track, “Hymn to Pan,” where the band really shines.